Born in the 80’s and back to rule the world once again, the Oakley Frogskins Sunglasses have a limited edition run of colors and design, so get ‘em while you still can. 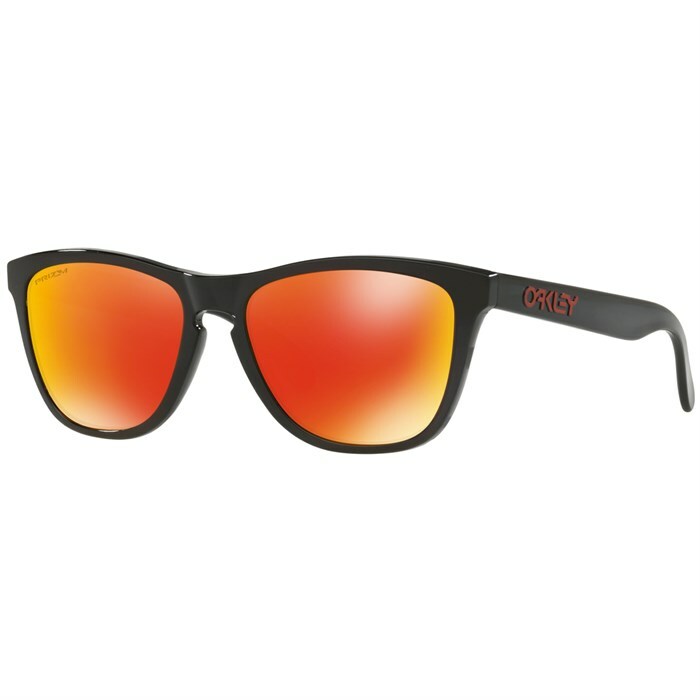 The frame is legendary and is paired with Oakley s best optics; the Frogskins know what’s up when it comes to eyewear. Plutonite® Lens Material  UV protection that filters out 100% of UVA/ UVB/ UVC and harmful blue light up to 400 nm. This is not a coating - the UV protection is from the lens material itself. High Definition Optics®  High Definition Optics® (HDO®) is a collection of patented technologies that allow Oakley eyewear to meet or exceed the testing standards of the American National Standards Institute for optical clarity, visual fidelity, and impact resistance. Iridium Lens® Coating [Select Colorways]  Designed to balance light transmission and reduce glare, this premium lens coating is made with superheated metal oxides. It is available in a spectrum of colors for optimizing vision in virtually any light condition. Polarized® Lens [Select Colorways]  Improving safety, comfort and performance, Oakley HDPolarized lenses filter out 99% of reflected glare without the haze and optical distortion that can come with polarized lenses made with conventional manufacturing techniques. Prizm™ Lens [Select Colorways]  A revolutionary lens technology that fine-tunes vision for specific sports and environments. Prizm™ lenses enhance contrast to better let you see obstacles like rocks and potholes before they reach out and bite you. Three-Point Fit  Ensures the frame makes contact only at the bridge of the nose and the sides of the head. It holds lenses in precise optical alignment with a secure fit that eliminates the pressure points common with frames that hook the ear. O-Matter™  A stress-resistant frame material that withstands environmental extremes, it is lightweight yet highly durable. Controlled flexibility enhances impact resistance while contributing to the all-day comfort of frames made with this innovative synthetic. Impact Protection  Backed by decades of innovation, Oakley performance eyewear offers uncompromising protection against high-velocity and high-mass impact. The protection is a benefit of the premium materials and unique architectures of Oakley lens/frame combinations. UV Protection  Plutonite® lens material filters out 100% of all UVA, UVB, UVC and harmful blue light up to 400nm. The protection is from the lens material itself.